Feuding families. A doomed civilization. Star-crossed lovers. A solemn mission that requires time travel. These characters and premises have been used in countless literary works, and they’re also the driving forces behind many successful films and TV shows (if you really want to be efficient, just watch Game Of Thrones to hit a bingo). Now you can find them all in Syfy’s Krypton, a new sci-fi drama set some 200 years before Superman becomes a household name. The hour-long prequel series, executive-produced by David S. Goyer and Cameron Welsh, obviously has plenty of its own lore to draw from—over the course of Superman’s 75-year publishing history, DC Comics has put out multiple titles that center on Kal-El’s home world in crisis. And the first season does seem to take a lot of inspiration from James Robinson and Greg Rucka’s New Krypton stories, which also featured the domed city of Kandor, which was also under attack by Brainiac (played here by Da Vinci’s Demons’ Blake Ritson). Showrunners Goyer and Welsh have made considerable revisions, populating the enclosed metropolis with an isolationist citizenry that must weather freezing conditions and regular revolutions, not to mention setting their show a couple centuries in the past. But Superman’s iconic cape—a bright red here, instead of the matte crimson of the DCEU—still casts a long shadow. After all, he’s the reason why Adam Strange (Shaun Sipos) rides the zeta beams across space-time to meet Seg-El (Cameron Cuffe). Kal’s grandfather is a handsome hustler and the last of his name after a failed insurrection leaves the House Of El in disgrace. The pilot episode opens on that fateful day, when Val-El (Ian McElhinney), a prominent scientist, stands trial for leading a rebellion against tyranny, i.e., Kandor’s oligarchical society. The exact nature of Val’s offense is revealed later in the season, but the first episode sets up several other storylines, including Seg’s forbidden romance with Lyta-Zod (Georgina Campbell), a member of the Sagitari. We also meet the voice of Rao, a robed figure who sways unsteadily under a multi-faced golden mask even as he issues his edicts. The elite guards, religious zealots, and Zods are right out of the comic pages. And yet, despite that lineage, Krypton rarely ever feels like it’s flying under its own power. Even when elements are plucked directly from the source material—like the caste system and color-themed insurgents—and introduced in later episodes, they look familiar for reasons that have little to do with Superman’s history. You could argue that the show is just full of archetypes, including the rogue with a conscience, the scheming politician, and the moral leader with unplumbed depths (Wonder Woman’s Ann Ogbomo, who is nonetheless riveting in the role). But Welsh and Goyer, the latter of whom co-wrote Man Of Steel and Batman V Superman: Dawn Of Justice, dress those well-worn conventions in the trappings of other properties. The show’s aesthetic and themes appear equally informed by its comic-book predecessors as Game Of Thrones, The Chronicles Of Riddick (though with considerably less eyeliner), Romeo And Juliet, Back To The Future (right down to the disintegrating symbol of an imperiled future), Doctor Who, and perhaps most glaringly, Caprica. For all the déjà vu, though, the direction is capable (Black Mirror’s Colm McCarthy helmed the pilot), with the first half of the season moving along at a good clip. The cast is even more talented. Cuffe is the star of the show, but only in the sense that things are happening around him. Seg is given more of a personality than his grandson on the big screen, but his performance gets lost in the palace intrigue and others’ technobabble. Campbell is game as his lover Lyta, but she has a much more interesting dynamic opposite Ogbomo’s Alura-Zod; the mother and daughter warriors grapple with their sense of duty and love for each other, which is a common enough arc, but the actors really sell the tension. Sipos’ Adam Strange is supposed to be a major player in this story, but he’s mostly forgettable. On the bright side, Wallis Day is charmingly deceitful as Nyssa-Vex, who’s a bit vain but nobody’s fool, not even her father’s (Elliot Cowan as Daron-Vex). And as a more agreeable member of the demimonde, Rasmus Hardiker brings a touch of Mos Eisley’s cantina to Kandor. 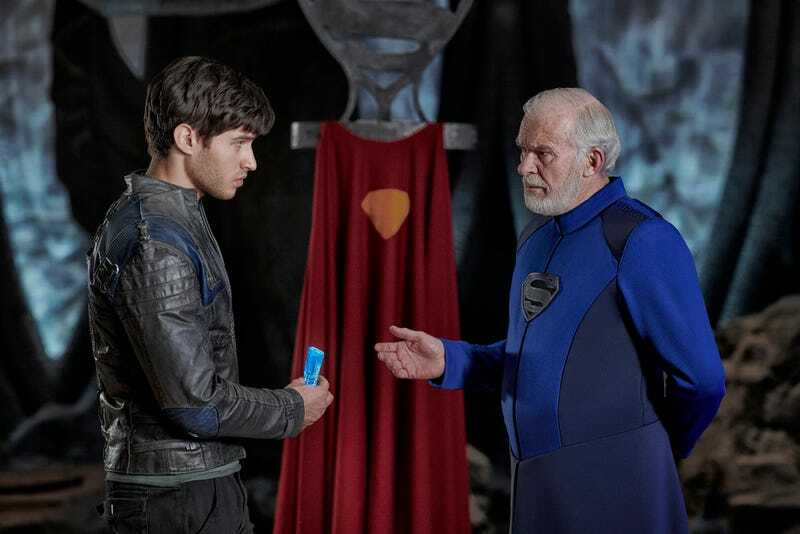 Krypton isn’t nearly as packed with references as, say, Ready Player One, but the little nods to the things like the MCU and, yikes, Fantastic Four: Rise Of The Silver Surfer, inhibit the show’s ability to establish its own identity. Even when the writing attempts to spare us a “Doctor Strange” pun, Krypton just follows beats from Kal-El’s story: the orphaned boy, the icy fortress, the Phantom Zone. They manage to create a through-line, but one that is hardly compelling (and did we mention it already exists?). Maybe the premise has been flawed from the start—just as Gotham has often made viewers wonder what’s the point of a Batman story without the Caped Crusader, Krypton struggles to justify its existence outside of its provenance. 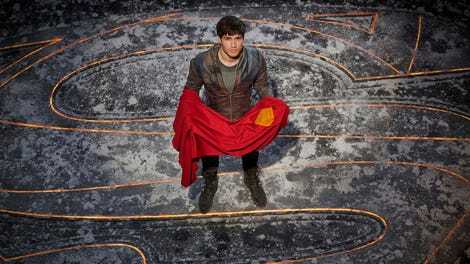 Which is paradoxical, really, since in the show, Krypton needs to survive in order for us to ever meet Superman. “All of this has happened before and will happen again.” That quote from Battlestar Galactica comes to mind as the first half of Krypton unfolds, but it could also apply to numerous other properties. The fact that it was first uttered in 1953’s Peter Pan makes it all the more appropriate here. There really isn’t anything new under the sun, whether it’s red or yellow. But Krypton should try to rise above being comfortably familiar. Reviews by Vinnie Mancuso will run weekly. IT'S A BIRD, IT'S A PLANE, IT'S... SUPERMAN'S GRANDDAD?